Longview Estate Wines was established by the Vuletich family in 1969. They pioneered winegrowing in Whangarei and Longview is Northland’s oldest established vineyard. 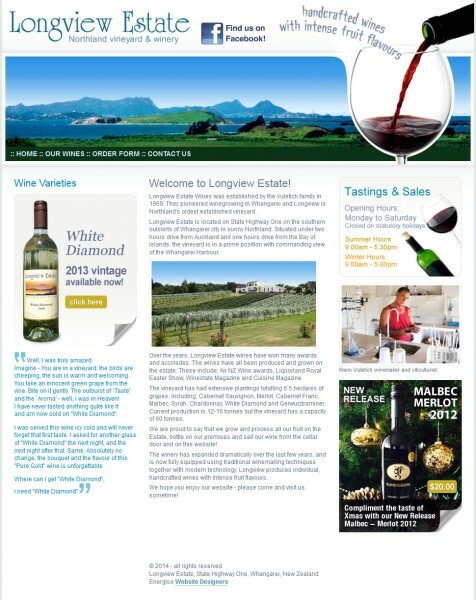 Longview Estate is located on State Highway One on the southern outskirts of Whangarei city in sunny Northland. Situated under two hours drive from Auckland and one hours drive from the Bay of Islands, the vineyard is in a prime position with commanding view of the Whangarei Harbour. Over the years, Longview Estate wines have won many awards and accolades. The wines have all been produced and grown on the estate. These include; Air NZ Wine awards, Liquorland Royal Easter Show, Winestate Magazine and Cuisine Magazine. The vineyard has had extensive plantings totalling 6.5 hectares of grapes, including; Cabernet Sauvignon, Merlot, Cabernet Franc, Malbec, Syrah, Chardonnay, White Diamond and Gerwurztraminer. Current production is 12-16 tonnes but the vineyard has a capacity of 60 tonnes. We are proud to say that we grow and process all our fruit on the Estate, bottle on our premises and sell our wine from the cellar door and on this website! The winery has expanded dramatically over the last few years, and is now fully equipped using traditional winemaking techniques together with modern technology. Longview produces individual, handcrafted wines with intense fruit flavours. Please come and visit us sometime!